The modern science tells us that the ecosystem of the earth is driven by energy received from the Sun. This ecosystem is steadily functioning on its own without any other stimulus. The entire cycle of birth, growth and death continues in this energy driven planet. This confirms that energy is the most important component for keeping a system in a functioning state. The same philosophy was prevalent in the earlier times also when modern science had not taken roots. The rishis and sages of yesteryears also visualized a system in which birth, growth and death took place. They did not keep them confined to the earth only but thought about the creation of the whole “Brahmand” (The Universe). They connected all the events with mythology. As per Hindu belief the process of creation, sustenance and destruction are three different types of works and these works are the domains of Brahma, Vishnu and Mahesh respectively. Together, these Gods are known as “Trimurti” (Trinity). However, the processes of creation, sustenance and destruction also require energy. These energy components are present in the form of divine feminine power which is referred to as “Shakti” or “Aadi Shakti” represented by Maha Saraswati, Maha Lakshmi and Maha Kaali. These three feminine energy sources are associated with Brahma, Vishnu and Mahesh respectively. Thus the whole process of creation, sustenance and destruction is driven by the three feminine powers symbolized by three goddesses. “Shardiya Navratra” (The nine nights of autumn) is significant for the worship of Maha Saraswati, Maha Lakshmi and Maha Kaali. The first three days are reserved for worship of Durga or Kaali. The next three days are the days of Maha Lakshmi and the last three days are the days for worshipping Maha Saraswati. The Navratra begins from the first day (Pratipada) of “Ashwin" (Shukla Paksha) month (conforming to September / October) and continues up to the ninth day (Navami). It is said that the first puja of this type was done by Lord Rama when he was preparing for a battle with Ravana. The Devi blessed him for victory and Ravana was killed. The tenth day of “Ashwin” is celebrated as “Dusshera” (Vijaya Dashmi) in memory of victory of Rama and annihilation of Ravana. Therefore, the total celebration extends for ten days from pratipada to dashmi. This year pratipada is on 5th October 2013 and Dashmi (Dusshera) is on 13th October 2013. This festival is very important in eastern India particularly in West Bengal, Bihar, Jharkhand, Assam, Orissa and Uttar Pradesh. The festival is also celebrated in Nepal, and other states of north India. In western India, this is celebrated with a heavy dose of Garba and Dandiya dances. The entire cultural character of these areas gets transformed completely during Navaratri celebrations. The nine days of the Navaratri have been divided among nine forms of Durga. Shailputri: The first day (pratipada) belongs to Maa Shailputri. This name is synonyms with Parvati, daughter of Himalaya. She took an oath to marry Lord Shiva and she is worshipped for this rock solid determination. The underline moral is to work hard for achieving success. Read more about Maa Shailputri. Brahmacharini: The second day (dwitiya) is reserved for Maa Brahmacharini. She is considered as a storehouse of knowledge and wisdom. She was created by Brahma for sustenance of the world for which knowledge was very important. She wears “Rudraksha” and lives like a “Brahmacharini”. Read more about Maa Brahmacharini. Chandraghanta: The third day (Tritiya) is the day for the worship of Chandraghanta. She emits a cool hallow like Moon and teaches the importance of good behavior, soft and sweet speech and gentle manners. She is the controller of anger and a protector from evils. Read more about Maa Chandraghanta. Kushmanda: The fourth day (Chaturthi) is the day for worship of the devi in “pindi form”. This form has produced the name “Kushmanda”. 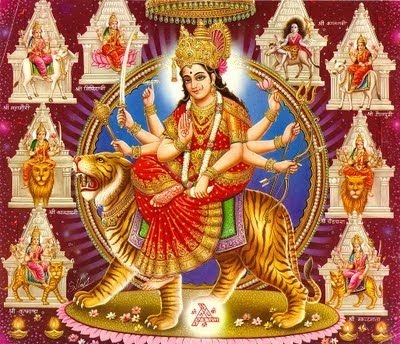 The goddess possesses 8 arms and mounts on a tiger. She has the power to save her devotees from trouble. Read more about Maa Khushmanda. Skandmata: The fifth day (Panchmi) is the day of Skandmata. Skand is the name of “Sanat Kumar” who was looked after by the mother. She has the unique power to transform even the ignorant into knowledgeable. She blessed Kalidas for creating two epics “Raghuvansha” and “Meghadoot”. Read more about Maa Skandmata. Katyayini: The sixth day (Shasthi) is the day of worshipping Maa Katyayini. She spent her time in penance in the ashram of “Katyayan Rishi”. She experimented with different techniques and therefore her name is remembered for research. She drives her devotees towards acquiring more knowledge. Read more about Maa Katyayani. Kaalratri: The seventh day (Saptami) is the day for worshipping the seventh form of Durga - Kaalratri. She is the destroyer of darkness and brings light to the world. She protects from enemies and makes her devotees free from fear. Read more about Maa Kaalratri. Mahagauri: The eighth day (ashtami) is reserved for the 8th form of Durga. “Mahagauri” is the name of Parvati and her “Siddh peeth” is at “Kankhal” near Haridwar which is close to Himalaya. She is the mother of Lord Ganesh and Lord Kartikeya. Read more about Maa Mahagauri. Siddhidatri: The ninth day (Navami) is reserved for the worship of the ninth form of Durga - Siddhidatri. She is capable of awarding every boon and is the ultimate power in this respect. Read more about Maa Siddhidatri. On the tenth day, the life size idols of goddess Durga are immersed in water. This also remains the Dusshera day when the effigies of Ravana, Kumbhakarn and Meghnath are burnt.